A++!! VIEWS-VIEWS-VIEWS!! 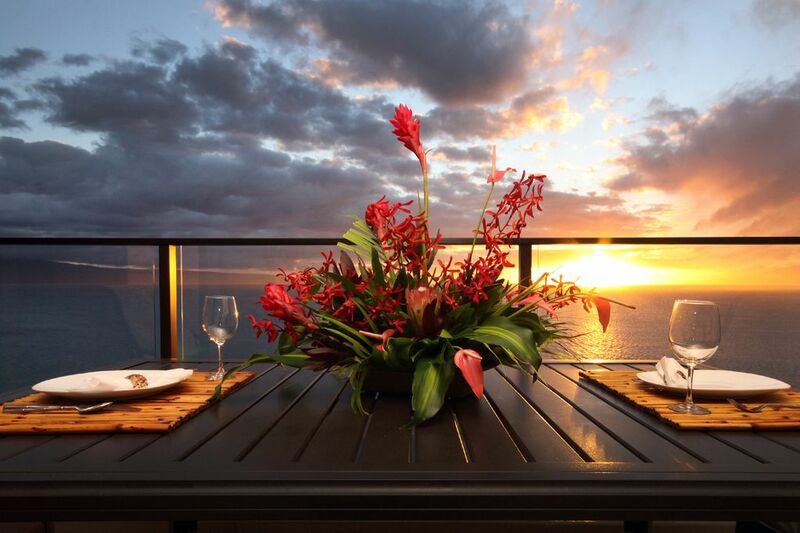 EXCEPTIONAL BEACHFRONT PREMIUM TOP-FLR PENTHOUSE! STEPS AWAY FROM THE BEACH!! YOU CAN'T STAY ANY CLOSER TO THE OCEAN OR GET A BETTER VIEW ON MAUI! Unit 1204 is a premium penthouse condo located at the beachfront, 12-story Mahana - a TRUE beachfront property. Enjoy unobstructed and breathtaking ocean views through #1204's floor to ceiling windows and from the spacious, newly furnished lanai! Our "home-away-from-home" is ideally suited for 1-2 couples, small families or a small group of friends. We are especially popular for those extra special honeymoons and couples celebrating special anniversaries. This remodelled and spacious 950 sf. one bedroom/one bath condo has tiled floors throughout and is tastefully decorated with a mood-setting Hawaiian motif. It has a well-appointed kitchen with stunning granite counter tops and sparkling appliances including microwave, coffee maker, cookware, rice cooker, blender, cooking utensils, storage containers and much, much more. This 12th floor upscale condo contains all the amenities you would expect from a first class vacation home. Central A/C, remote controlled ceiling fans in each room, recessed and dimming ceiling lights throughout, full-size washer and dryer, new 65" HD Smart television with sound bar and a 42" HD television in the bedroom both with premium cable. These are just a few of the many upgrades welcoming you when you arrive for your best vacation ever. The remodelled bath area with its step-in travertine tiled shower with seating is complete with a soothing, rainfall shower head along with a traditional style shower head. A well lit, separate dressing and sink area is centrally located for convenience. Our beautiful home is furnished with a PREMIUM Simmons pillow-top Cal-King mattress encased in a bedbug protective cover; Queen sleeper sofa with upgraded mattress (linens are provided); Butter-soft leather recliner and High Definition Smart televisions with upgraded premium cable located in the bedroom and living room. We also provide an Ipod docking station and DVD player (DVD's available for rent in the lobby). The tiled and newly furnished lanai with its table and seating for four, offer you PRIVACY and a place to relax and soak-in OCEAN VIEWS and beautiful, romantic SUNSETS! The Mahana offers direct beach access for sunning and snorkelling, along with a swimming pool, Jacuzzi hot tub and two nicely appointed barbeque areas with top of the line, stainless steel barbecues. A newly installed, lit walkway begins at The Mahana and proceeds past neighboring Duke's restaurant to Black Rock at the Sheraton hotel. First class golfing, restaurants, Snorkel Bob's dive shop, grocery store and shopping are within walking distance. We provide beach towels and linens along with free local and long distance (US mainland) telephone. Take advantage of the opportunity to stay and indulge yourself at our BEACHFRONT, luxury condominium home with 100% unobstructed ocean views and stunning sunsets from the living room, bedroom and lanai! Imagine seeing only glorious blue sky and ocean upon entering this beautifully decorated and tastefully furnished vacation property. The living room view with its wall to wall, floor to ceiling windows is truly beyond description! Additionally, the bedroom and living room open to the tiled lanai where your views and sounds of the ocean will lull you to sleep and be the highlight of your vacation. *** READ OUR REVIEWS, CHECK OUR CALENDAR AND BOOK INSTANTLY ONLINE! DON'T PASS UP THIS OPPORTUNITY - CONTACT US TODAY BEFORE YOUR DATES ARE TAKEN!! WOW!!! Openings in March and April 2019! Stay in our beautifully decorated, top-floor condo with unobstructed MILLION DOLLAR ocean VIEWS during WHALE SEASON with absolutely NO resort fees and FREE parking! Call us (925)366-6641 or request online to reserve. We accept VISA, MASTERCARD and DISCOVER credit cards. An approximate 3.00% convenience fee is charged for credit cards issued in the U.S. and vary for credit cards issued outside the U.S. Contact us for fee if using a non-U.S. bank or credit card. Credit card fees are non-refundable. Upfront deposit to reserve our unit includes this fee ($520.00 total). However, when paying in full or your remaining balance with a credit card, the fee will be billed separately and is NOT included in our quote unless otherwise specified. There are NO resort or parking fees. Each unit is provided 1 parking space per reservation. Handicapped parking is available. There are NO additional fees for cleaning with a 6-night minimum stay. Reservations of 14 or more nights may be charged an additional housekeeping and cleaning fee. We encourage trip cancellation insurance to avoid being penalized for last minute cancellations. A $150.00 cancellation fee will be imposed should you cancel for any reason and no refunds will be given if cancelling 90 days or less from your arrival date including delays due to inclement weather. However, we will always attempt to fill the vacancy to minimize or avoid forfeiting any money paid whenever possible. Mahalo! Keywords: Condo, top floor, penthouse, beachfront, ocean views, premium unit, updated, remodelled, spectacular views, unobstructed views, beautiful, tropical, air conditioning, swimming pool, beach access, bbq, hot tub, stunning, king bed. Aloha! We are John and Linda Waite and Kathy Roberts, proud owners of this outstanding 1 bedroom, 1 bath vacation property at The Mahana in Maui, Hawaii. Linda's first visit to Hawaii at the age of 5 was the beginning of her lifelong love affair with the Hawaiian islands and her desire (shared by husband John and sister Kathy) for a piece of paradise. After numerous Maui vacations, staying at various resorts across the island, our decision to purchase at The Mahana was realized in 2000. We vacation in our home at The Mahana throughout the year to ensure it continues to meet our high expectations. We strive to make our vacation home the best of the best at this first rate property by continually upgrading and improving it with each visit. From the moment you step through the front door, we believe you will know your decision to choose our home was absolutely the right one! Mahalo! After years of visiting Maui and staying primarily at resort hotels, sisters Linda and Kathy knew after seeing the beachfront Mahana it was something very special. Seeing The Mahana's simple and easy access to the quiet beach, absolutely glorious views, immaculately maintained grounds, large pool with relaxing lounge chairs and sounds of the surf in the background, made their decision an easy one. When the opportunity presented itself soon after in the year 2000, they bought unit 1204 sight unseen. To this day, the thrill of seeing that million dollar view as you step inside never gets old. Still just as amazing now as the first time! toilet, shower, Standard and overhead rainfall showerheads. Separate bathroom/shower with adjoining dressing area with sink. Large, beautiful step-in, travertine tiled shower with a convenient corner seat. Relaxing rainfall shower head in addition to a traditional wall mounted shower head. Unobstructed view from our unit. Floor to ceiling windows offer nothing but blue sky, ocean and beautiful sunsets! Central air conditioning in addition to remote controlled, variable speed ceiling fans in all rooms. Yes, bed linens for both the master bed and sofa bed are provided. Full size clothes washer located in our unit. Full size, electric clothes dryer located in our unit. We offer free wireless access to the internet in our unit in addition to wireless access throughout the Mahana. Free wireless internet access is available in our unit and through the resort. Spacious LR w/ adj. dining area. Decorator touches include a stunning Wyland print and a bronze sculpture depicting swimming sea turtles. Recessed dimming lights and ceiling fans. New 65" HD Smart TV. FRENCH-DOOR REFRIGERATOR with filtered icemaker/cold water dispenser. Various non-perishable items such as spices, salt, pepper, sugar, etc. are usually left by previous guests. We do not stock the pantry but many items used commonly for cooking can typically be found. Dishes, glasses, mugs and eating utensils available along w/ pans, bowls and other items used for preparing meals. Auto coffee maker, rice cooker, toaster, blender and sun tea maker/dispenser. Hawaiian motif, glasstop dining table and dining chairs. Comfortably seats 4 adults. Adjustable speed ceiling fan in dining area. Recessed, dimmable lighting in dining area and throughout unit. Cable. Showtime and other premium channels available. A large selection of books which are available to borrow/exchange and can be found in our media cabinet. Puzzles and board games located in hall closet. Videos available for rent in lobby. Luscious grounds immaculately maintained. Lawn area with chaise lounge chairs located between pool and beach. Kayak snorkeling excursions available for booking. Mopeds and bicycles available for rent nearby. Various boating and sailing excursions available for booking. Tennis courts and pickle ball courts on-site. Available at no cost to Mahana guests only. Multiple golf courses nearby and on the island. Elevator access to all floors. Unit has tile floors throughout. Step-in shower with corner seat. Threshold into shower approx. 3 inches high. Well maintained and manicured pool area. Shaded patio table seating available. Lounge seating by pool and on lawn. Mechanical chair lift for assistance into the pool/spa. Restroom/dressing room areas. 'Refueling' station for electric vehicles located in the parking lot. Many of Maui's finest hotels, resorts and condo rentals are located along the 3-mile stretch of Kaanapali Beach. Beginning at The Mahana is a paved and lit oceanfront walkway for strolls to Whalers Village and beyond. An easy walk allowing one to explore the area, take in the views or dine at neighboring restaurants such as Duke's which is located next to The Mahana. Two 18-hole championship courses are nearby: The Royal Kaanapali and the Kaanapali Kai. Many others are scattered throughout the island. If a luau is on your list of things to do while in Maui, there are many to choose from: Drums of the Pacific Luau (at the Hyatt), the Marriot Luau, the Sheraton Maui Hotel's Sunset Luau and the Royal Lahaina Luau. Whaler's Village has a nice selection of boutiques and galleries if you like to shop. There is also the quaint historic whaling town of Lahaina about 6 miles away. Here you can enjoy colorful Front Street with its many shops and restaurants. You can view the huge Courthouse Square banyan tree, visit the Baldwin Home and Museum or take an ocean excursion from their harbor. Of course, there are also beach activities such as sunbathing and snorkelling. Equipment is available to rent across the street from The Mahana.